← Broad Shoulders Animal Rescue Bake Sale!!! Supra Vaider Low would be the skate shoe for all the little Anakin’s out there that don’t want a hight top. The Vegan version comes in speckled black and white canvas upper. It gives off a ‘still not fully evil’ look that might otherwise come with all black. Vulcanized soles, and flexible soles give some good board contact. 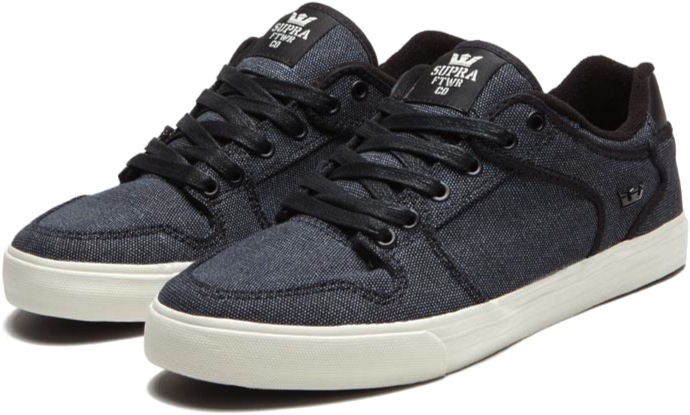 I think its funny Supra calls this shoe a low top. I guess in their world of thigh-high skate shoes this one is pretty minimal. The Vaider Low has some medium padding on the collar and tongue, and added canvas layer on the toe for the tech look.